It was going to be rainy all week, and on Monday when I scheduled myself into a 172 for today there was no telling what the weather would be like. 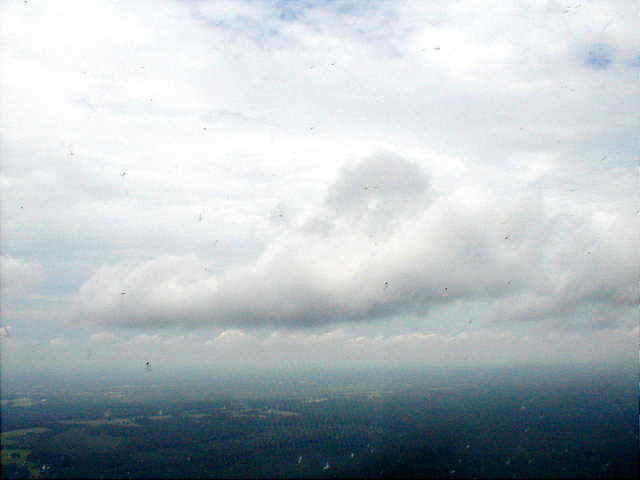 I planned to fly to Marks Muni, W63, close to Lake Gaston and near the NC border, a distance of about 70 nm each way. When I woke up, there was an overcast, but the AWOS said "no clouds below twelve thousand," so I was encouraged. Then I phoned WX-BRIEF and very soon heard the briefer say, "That's near South Boston, right? VFR flight is not recommended in that area." Well, shoot. But the sky appeared to be clearing, so I thought, well, maybe I'll start out in that direction and see what it looks like from the air. By the time I arrived at the airport, the sky was completely blue above and pretty much all around, so I began feeling more hopeful. It looked like a lovely day for flying. But I checked the DUATS radar in the FBO, and it didn't look quite as promising, and by the time I'd preflighted and was taxiing to runway 15, the wind had picked up to 220 at 12, and the high overcast was back and scattered low clouds had begun to blow over the airport. I had to level off at 1500 feet because the cloud bases were at about 2000. Still, the visibility beneath the clouds was quite good, so I headed south, still hoping. Naw, nothing doing. Up ahead the clouds kept getting lower and lower, and by the time I reached Lake Chesdin, it was clear that the sky was not clear enough to risk the trip. So I turned west and flew to the practice area, did a couple of steep turns, just to see if I could still hold my altitude (ahem!--not very well at first), and headed back to the airport. I was number three for landing, and to maintain clearance I flew the downwind leg a bit wide and extended farther than I normally would. One nice little thing happened then: The two pilots landing ahead of me sounded slightly tense in their radio calls, so I said, "... turning a wide base for one five." That's not quite standard radio talk, but I thought it would let the guy just ahead, a student pilot, know that I wasn't right behind him. I don't know if it worked, or not, but it seemed to me at the time that we were in some sort of communion for that moment. The crosswind landing was interesting. I found myself crabbing about 15 degrees to the right on final and was thinking ahead to the procedure for slipping--keeping the upwind wing low with right aileron, while using left rudder to align the airplane with the runway. But then the wind died down considerably a few feet above the pavement, and although it was technically a crosswind landing, the amount of crossed controls needed was minimal.